KESDEE's solutions for the enterprise covers the entire spectrum of the learning cycle of an organization to ensure a smooth learning experience. KESDEE's end-to-end e-Learning solutions help the industry in meeting the challenge of developing standardized and cost efficient e-Learning programs that are aligned to their business objectives and effectively imparting learning for geographically dispersed employees. We have adopted a three pronged strategy to achieve this by offering Content, Technology, and Consulting Services to improve the learning operations of an organization. KESDEE has worked with the prestigious regulatory bodies such as the Federal Reserve, OCC, and FDIC among others to fullfill their training requirements. We have core financial concepts courses that provide fundamental skills for beginners. We also have specialized courses suitable for advanced level learners. KESDEE closely works with professional associations to provide them fully-customized e-learning solutions suitable for their members. We develop customized / branded e-learning portals that can be used to manage the training of all the members of the professional association. We provide a "ready to go" solution on a revenue sharing basis. You can get opportunities for professional development and also have an attractive source of revenue. In all the industries, sectors, and countries, the goal of business is the same i.e., to increase shareholder value. Therefore, finance skills are critical to managers across functions. KESDEE helps your employees acquire finance skills within the context of your business. When you use our e-learning courses to train your employees, we work with you to identify the skill gaps in your organization, identify the right set of courses, and provide a custom solution as per your needs. Our global experience in delivering financial learning is unmatched. We have built on this experience to create solutions for your specific needs that are critical for the success of your employees. Finance professionals need to constantly update their knowledge and skills to keep pace with the growing demands of the workplace and to enhance their careers. They not only need to know the basic skills to perform their job but also keep themselves abreast with the changes in regulations and industry trends. At KESDEE, we have developed customized learning paths to help the individuals hone their skills on any subject of their interest. Our learning programs are highly flexible and are provided under a conducive learning environment. We also provide exam preps for popular finance certifications such as APRM, PRM, FRM®,CFA® level 1 and Claritas® Investment Certificate Exam. KESDEE Inc. offers you a suite of Learning Management Solutions with high utility and low cost ownership. The Learning Management System from KESDEE (K-LMS) is a software package that automates training. It is a scalable and flexible platform for managing both instructor-led and e-learning activities, resources, curriculums, and courseware catalogs across the enterprise. The product is an end-to-end fully integrated learning solution that enables customers to manage their entire training. K-LMS is compliant to SCORM 1.2 (Sharable Content Object Reference Model) specifications. K-LMS is capable of launching SCORM compliant courses. K-LMS has been thoroughly tested and proven on various operating systems and databases. Designed as an enterprise class distributed object application built on web technologies and relational databases, K-LMS helps you to integrate e-learning solutions into your existing infrastructure with minimal effort. 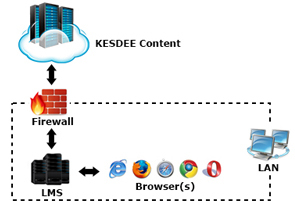 KESDEE deploys and manages the K-LMS along with the IT infrastructure. Using this outsourcing model, the organizations can benefit from hassle free access to e-learning content by spending less time and effort on technical support issues with respect to the IT infrastructure. ASP model leverages the power of shared computing, thereby making it a cost-effective solution for all. This model comes with attractive price options based on the number of users. 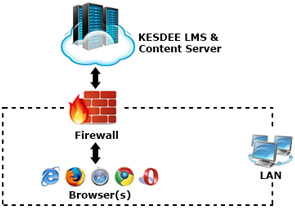 KESDEE will install and configure the K-LMS on either the Intranet/Internet servers of the organizations. Training is imparted for using the various attractive features of the LMS. KESDEE provides maintenance and version updates on K-LMS annually, subject to the terms and conditions of the contract agreed upon initially (may be altered as per the requirement from time to time). KESDEE provides a content server SCORM 1.2 package that would contain course, access information, and SCORM communication methods. Content server approach for SCORM package delivery enables 'Remote Learning Management System (LMS)' to access the course content from KESDEE servers in an authenticated way. Content would be served from KESDEE servers while launching the courses through LMS based on the course access information. This way, the Remote LMS can retain all of its features, both Admin and User level since the course information and user tracking data will be persisted in Remote LMS. LMS administration will be free with maintenance of large amount of course content and updates. Content server approach would be an ideal solution when client/partner has their own LMS application solution and want to acquire the content from KESDEE to deploy into their LMS. Helps organizations in developing marketing presentations and other marketing materials. Capable of launching SCORM 1.2 compliant courses. Compatible with databases like Oracle, MySQL & SQL server and with any operating system. Hence the additional investment on Hardware & software to run our e-learning applications can be avoided. "It's all about creating good content," that is the credo we follow at KESDEE. User friendly applications, feature/interactivity rich content, and relevant evaluation tools are seamlessly integrated in our services, thus addressing your e-learning, Training or Solution needs. This complete solution will be applicable for the users who is looking for both Learning platform and Content to start the program. The solution offers industry leading K-LMS and high quality KESDEE content integrated to start the learning at one go. The managed content Service suite would applicable for the organization who owns their own learning platform and wants to get KESDEE content to be incorporated with that. The Dynamic Assessment Engine can be provided as a software service that provides essential practice for strengthening the learning process. Designed to make standalone assessment engine for quick knowledge evaluation. Tests are written to the highest standards of technical accuracy where you will find a set number of attempts that contains unique set of questions from the random pool. Users can view a graded exam showing correct answer, wrong answer, along with the entire list of questions and their feedbacks at the end. Further, the system dynamically collect calculates, generates candidate’s reports immediately. e-Learning makes it feasible to access training on demand, at home, office, or anywhere 24x7x365. Education is available when and where required. With e-Learning, the money is invested in education and not in logistics or travel. e-Learning offers the option to choose from a variety of interactive self-paced courses and the learners can take advantage of an extensive reference library. Multimedia presentation and interactivity reinforce understanding and retention of information. With e-Learning, it is possible to monitor the learner's progress, skill attainment, and produce detailed usage reports and assess their levels of improvement. e-Learning content can be tailored to the interests and career objectives of individuals, groups or business objectives of the organization. e-Learning makes it possible to update the information instantly. e-Learning can always complement other forms of training and become a part of overall training solution.